The utilities fighting net metering for rooftop solar are biased, but it should still be replaced by a declining value-of-solar tariff. The pricing of distributed solar energy has become the object of fierce struggles: not only in Arizona and Nevada, but in previously generous Germany and Britain. Utilities in US states claim that solar households enjoying net metering are getting a free ride from their unpaneled neighbours â€“ they will still rely on the grid in the evenings, but no longer pay their fair share of its costs. Several utilities are proposing to replace net metering by a much lower feed-in tariff, generally close to wholesale, plus higher fixed charges. In Nevada they the PUC [corrected, see comments] even initially proposed making the change retroactive, an underhand manoeuvre previously only carried out in Spain, the Czech Republic and a few other jurisdictions indifferent to their reputation with investors. 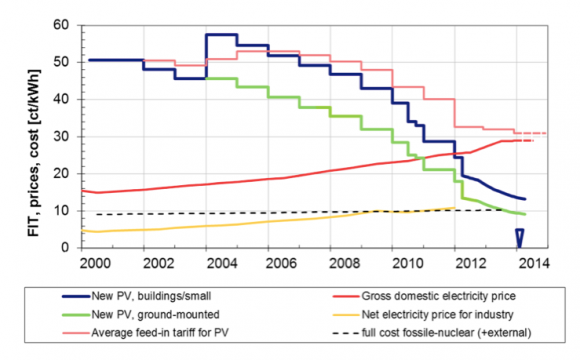 In Germany, the feed-in tariff (FIT) for solar has been cut to 12.3â‚¬c/kwh, under half the retail rate of 29â‚¬c. In the UK, the government will cut the residential solar FIT to 4.39p/kwh, under the wholesale price of about 5p/kwh. In both countries, there is a suspicion that the slowdown is a pander to the hurting fossil fuel interests. Solar advocates are crying foul, and accuse the utilities of trying to stifle competition from an upstart technology that is cutting into their profits. SolarCity has ostentatiously suspended operations in Nevada. What should the non-expert concerned citizen make of the disputes? I have two suggestions. One is the standard heuristic of amateurs in technical matters. Don’t try to make yourself an expert, just understand enough to make an informed judgement as to whom to trust. Look for unbiased and qualified sources of information first, which gives you a handle on the self-interested ones, since you can’t avoid dealing with them entirely. Here Margaret Thatcher’s electricity privatisation in 1990 comes to the rescue. It was the one she got right. The key measure was to split the grid from generation. The grid is a technical monopoly and has to be run either as a public service or a tightly regulated chartered private corporation, a Ma Bell. Generation can and should be competitive. The grid doesn’t just transmit the electrons and bill customers. It runs the market in generation. The model was copied in Texas (IMHO, the equivalent for Governor G.W. Bush of Stalin’s Moscow metro). The EU Commission got enthusiastic and secured the adoption of the model as a European norm. In France it’s a Potemkin separation: the grid operator RTE is a wholly owned subsidiary of the state monopoly generator EDF. 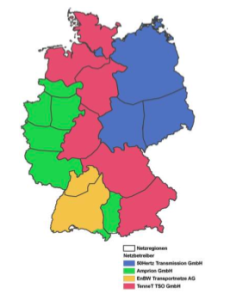 In Germany it’s real, and the grid is divided into four large zones run by different management companies (TSOs). Oddly, the largest TSO, Tennet, is wholly owned by the Dutch government. India and China have also split grid from generation. The alternative model is the monopoly regulated utility, as in most of the American South. (New York and California have confusing and complicated hybrids that I do not pretend to understand.) The US war on residential net metering is concentrated in these ancien rÃ©gime states. The utilities have more or less guaranteed returns on assets, generating as well as transmission. They have a clear financial interest in stopping rival generators on their territory, and their claims should be read with s hefty dose of suspicion. The statements of unbundled grid operators are quite different in tone, and supportive of the energy transition. The fundamental solution was to accelerate clean energy, with the aim of replacing coal and oil….The only hurdle to overcome is â€˜mindsetâ€™. Thereâ€™s no technical challenge at all. The idea of baseload power is already outdated. I think you should look at this the other way around. From a consumerâ€™s point of view, baseload is what I am producing myself. The solar on my rooftop, my heat pump â€“ thatâ€™s the baseload. Those are the electrons that are free at the margin. [Schucht] believes that integration of 60 to 70 per cent variable renewable energy â€“ just wind and solar â€“ could be accommodated within the German market without the need for additional storage. Beyond that, storage will be needed. The study concludes that grid integration cost of PV [in the EU] is relatively modest, and it will increase to around â‚¬26/MWh by 2030. So independent expert opinion is that high penetration of solar electricity is entirely manageable at reasonable cost. It does look as if the alarmism of Nevada Energy is down to vested interest. That does not mean that net metering, the policy being attacked, is a good idea. It was basically the simplest way of getting rooftop solar connected to the grid. The old electromechanical meters ran backwards when the current flow was reversed, and that was the least effort solution, so it took hold. There is no reason to think it is optimal, apart from its brain-dead simplicity. 1. What is the right level of subsidy for solar electricity from any source? 2. What a fair price for rooftop electricity, independently of the subsidy? Take the second first. In 20 years at most, rooftop solar will not need any subsidy, and the grid will be 90% renewable. Let’s try to set our fair price for solar in this world. We assume away the vested interest of Nevada Energy in its generating assets; the commissars have introduced the Thatcher-Xi-Bush unbundling. The wholesale market for generation has two forms: a long-term PPA, enabled by the complete stability of renewable generating costs â€“ this is the only remaining useful sense of baseload; and a spot or day-ahead market to deal with variations in demand. A rooftop solar supplier sells electricity into a local distribution grid, where most of it is re-used without calling on the high-voltage system. The residential and commercial resource therefore lowers the need for investment in transmission, especially if it is coupled with decentralised storage. However, it needs higher-cost backup: imports, grid storage, load management, geothermal, overbuild. It looks as if the rooftop owner should get a rate better than spot wholesale but worse than retail. There is no reason why rooftop suppliers should get the full retail rate through net metering. Access to the grid has a value for sale as well as purchase. Why should it come free? That is the end state. Where we are now is a world of massive unpriced carbon externalities. Absent an infeasible direct carbon price, renewable energies deserve to be subsidised, or incentivised by regulation. offer a comprehensible and predictable glide path to wards the all-renewable. subsidy-free end state we have sketched out. Net metering scores badly. It does not decline over time, and is more valuable to late adopters than early ones. By the same token it becomes more costly to other grid users, just as the need for the break gets weaker. It really does look as if net metering will have to be replaced in the USA by a more complex value-of-solar tariff (VOST), as in Minnesota and (surprisingly) Maine. The political problem is that deep suspicions have been created by the current war on residential solar by the silo utilities, egged on by the odious ALEC front of the Koch brothers. The path forward passes through breaking up the monopolies and their incestuous relationship to state regulators. 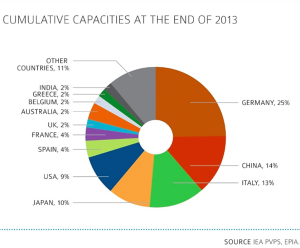 Solar customers in much of Europe are in a buy-all, sell-all model. Consumers continue to pay for 100% of their consumption and the utility installs a second meter to measure the solar production and compensates it with a â€œfeed-in-tariffâ€ (FIT) rate. Network operators must immediately and physically accept, transmit and distribute all the supplied electricity from renewable energies. When the operator of the installation so requests, this obligation also includes commercial acceptance. The term I have translated as “supplied”, verÃ¤uÃŸert, is clearly distinct in meaning from “produced”, which would be erzeugt, hergestellt, or produziert. 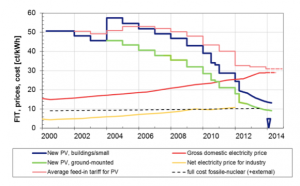 Besides, there was a special subsidy in Germany for self-consumed solar electricity from 2009 to 2012. This would make no sense if householders legally had to â€œsell allâ€. What must have happened is this. The early German FITs were well above retail, starting at 50â‚¬c/kwh in 2001. It made sense for early adopters to sell all their solar output at this advantageous rate, then buy all their needs at the lower retail rate 0f 15-20â‚¬c. The FIT matched retail in 2011 (29â‚¬c) and fell well below it in April 2012 (19.5â‚¬c). At this point solar roof-owners acquired an incentive to maximise self-consumption (Eigenverbrauch, Eigenstrom) and minimise exported current. They were always free to do this. I don’t think this is a minor niggle. The German FIT for solar energy created the mass solar market. As a public policy measure in technology, it rates in historical importance with DARPA’s development of the early Internet and the British Air Ministry’s support of radar in the 1930s. My confidence in Professor Wolfram has taken a big hit. And so should yours. When experts make significant mistakes on fact on things you know about, they should lose credibility. Not completely, as with detected lies: falsus in unum, falsus in omnia. For simple mistakes, it’s erratum in unum, dubium in alia. And bloggers? Yes, up to a point. In mitigation for my own mistakes in reporting, I claim a lower bar. I don’t advertise any credentials outside the field I used to work in, and I link to my sources. I don’t generally have the resources to double-check these, and you should not expect it. It’s up to you what credence you give to say Greenpeace on Chinese coal production. Well I am not even a knowledgeable observer about solar, and to me it's unfathomable how someone could even decide whether or not to sell their power — being a non-owner of a solar system, I guess I always assumed that whatever didn't get used would be put right into the grid? I didn't know there was a home storage option. As for experts, errors are bad… but I trust someone more if they admit them than if they never made the error. Unless it was a whopper, but then often there is some sort of explanation. So, if you're bored at all… we here in LA are trying to figure out how to reform the governance of our City-owned Department of Water and Power, which in some respects is more the dog than the tail, politically (or so I am told). Whether to have a professionalized board, yadda yadda, and who should appoint them. Though I suspect the issue is our City Council, as that is almost always where problems begin. We have massive repair and maintenance backlog (a very big number, with $Bs), a bunch of expensive green mandates, a seriously cr*ppy new billing system which has abused customers (how come government computer systems never work? or did you already cover that? ), a DWP union which may be too powerful since its workers are paid a premium and the City leaders appear to live in terror of it, a system in which said DWP pays a big "kickback" to the City which props up the general fund… aaaaaaand, a rate hike that appears to be getting rubberstamped without the reform that our leaders keep promising. So if you know anyone who's gotten this right, feel free to name names. Just off the top of your head, if you know any. I don't know what I think yet. Soon when they get the rate hike it will be too late anyway for a few years, until they need more money. Maybe by then I will have a clear picture. It's because solar homeowners don't have a choice that the price really has to be tightly regulated. Ah, okay, now I get that. The point is that it's not really about the grid costs for the utilities… they see an existential threat? But I understand what you mean about the vulnerability at least. Thank for the suggestion of useful organizations to think about. DWP is, afaik, quite good technically at the water and power. And comparatively cheap too. And if I have to choose between the City Council (which is barely functional) and the DWP, it's not even close. As always it's a cost issue – we have all these new green mandates coming but people feel like the workers get paid too much and have too much political power. I'm just not sure I see a better alternative. The City owns it, but is ruled by it. It's very weird. Anyhow thanks for the input! Guilds! St. Clement!!! Maybe we need more of that sort of thing here. Well, at least some Tsarist Okhrana agents were never sure what side they were on (one assassinated a high Tsarist official to prove his bona fides), and the Prussian General Staff was reliably operationally excellent and strategically and politically moronic. But one can add most social security administrations (almost all deliver complicated benefits to a wide group that includes a significant number of dis-functional people at a cost much the same as the large private financial institutions), a number of Australian public service agencies I know of, maybe DARPA. The US missed the wave of public service changes that swept Europe in the late C19, and has suffered since. On government IT – i was on the margins of a very big IT failure. It was pilloried mercilessly (rightly so) – cost some hundreds of millions. In the same quarter, four large companies wrote off comparable sums on large IT, to more or less zero publicity. There ought to be a way around this. Seems to me maybe it would save money if organizations wrote their own programs… even if it takes much longer to, say, train medical people to code (not all of them, just a few hardy volunteers). They know what they need better than anyone else. "[T]he Prussian General Staff was reliably operationally excellent and strategically and politically moronic. " This more or less describes the DWP (union leadership). I like having water and power … and I'll be sorry to see it get crushed by angry voters, as I fear could happen someday. They really just need to be tweaked a bit, attitudinally, so that we can go back to trusting them. They don't need anything too severe, imo. Meanwhile our pols are so timid and so feckless that they don't do a thing, which given their output may almost be a good thing. Union self-reform may be more likely than political effectiveness. I also don’t see it as reasonable for organizations to write their own applications, because large projects fail on the friction between various stakeholders. Conflicting technical requirements, turf wars, mutual incomprehension between key people, impossible deadlines – these are what kill large projects most often. There are dodgy consulting shops, sales people who sell the impossible and unexpected budget problems as well, but generally the problem exists, as the technical support cliche goes, betwen the chair and keyboard. Custom development in house is generally prohibitively expensive for most software, too – in dollars, time, opportunity cost and people. Software development is expensive, maintenence is more expensive, and generalized software that can be customized just makes sense. Unless they should build their buildings and furniture as well? Good stuff, as always. Bookmarked for sharing later. I appreciate your clear, cogent explanations. FWIW, I read the utility didn't request retroactivity – that was a frolic by the Pub Util. Commn. The time period for transition was also extended from 4 to 12 years, which I think makes a big difference. Hopefully 12 years from now, the cost of solar will have dropped to a level where it can pay off at closer to wholesale rates. Batteries will also help as they get cheaper over the next 12 years. Thank for the correction, fixed. "This brings us to question 1: how should this be organised? It’s a question of public policy, not one for utilities." We can foresee a possible future where our entire national energy needs can be met with carbon-free electricity generation. This will require a capital investment equal to only several years worth of current fossil fuel spending. The longevity of the infrastructure looks to be at least twenty years to as much as a century in some cases. There will be zero fuel costs, and many orders of magnitude more fuel available than can be consumed. Maintenance costs will be a somewhat lower than they are now..
Should not that discussion about public policy, then, include the idea that energy could and should be provided in abundance and at no cost to users? Why not nationalize the whole system and pay for it the same way we pay for our police, fire, and street departments – out of our national, state and regional tax base? I agree that the future will be one of energy abundance not real scarcity, in the sense that ample additional supplies can always be obtained at low cost. If the energy were EGS geothermal or magic cheap fusion, going priceless might look good. My first reaction is that the technologies heading for dirt cheap are the variables, and will need backup that is on current trends going to be much more expensive. Daily gyrations in price from zero to 30c a kwh are not a sensible basis for ordinary consumers, so we may be heading for a fixed fee as with bandwidth. Free marketeers tend to assume that ordinary people enjoy spending their time on haggling, as they do. Not so. Fancy pricing schemes will only be acceptable if interaction with them can be delegated to Nest's robot great-grandchild Jeeves. Depends on timeframes. Since energy use ends up as heat, and there is a limited capacity to absorb heat at the planetary surface, growth at current rates would cook the planet in as little as a few centuries. If sustainable means anything, it means millenia, not centuries. Huh? Solar and wind energy (and in a more roundabout way, so do hydro and wave) just tap incoming solar radiation. It's surely impossible for increased diversion to cook the planet. Global warming absolutely needs greenhouse gases trapping the heat in the atmosphere. Does tapping tidal energy slow the earth's rotation? As I've said before… if what you both say is true, then a) Hallelujah! and b) hardly anyone knows this is coming. Solar energy is one of the best source of energy and it's pure natural. The Institute for Local Self Reliance report “identifies the combined value that solar electric power plants deliver to utilities’ rate payers and society’s tax payers.” In other words, beyond the typical things we officially assign it value for, the report looks at other clear benefits it provides and tries to calculate those to come up with an overall total value. Nice post. Very useful information, I am bookmarking your web to get the latest update from your side. All the best keep up good work. Previous Previous post: What if the (non-Republican) electorate isnâ€™t as angry as everyone says it is?